Alia Bhatt's 'Roop' from Kalank is shy but fiercely confident. She's a damsel but strong headed at the same time. One of the best-dressed celebs in the industry today, she's a delight for any designer and a treat for sore eyes. 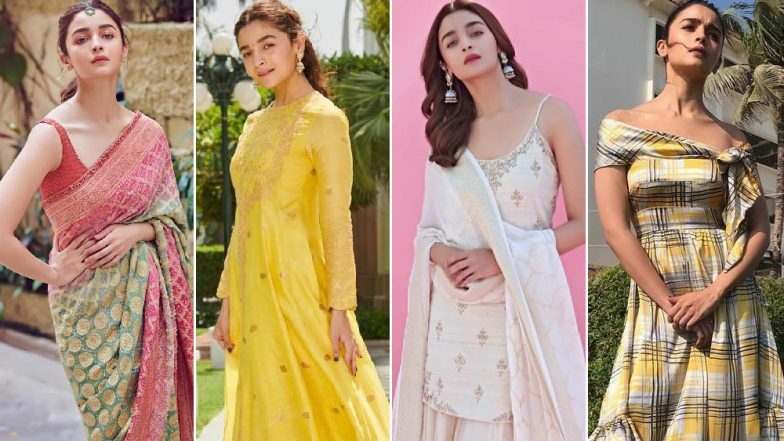 Alia's style file for her promotional outings vary with her on-screen characters and this time, it was more about traditional silhouettes coupled with mixed hues. With the help of her ace stylist, Ami Patel, Alia successfully juggled between different designs with some disappointments here and there. Overall her style palette was easy-breezy and an instant turn on for any fashion lover. Kalank Movie Review: Alia Bhatt, Varun Dhawan, Kunal Kemmu Shine in a Beautifully-Framed but Dull Love Saga Set During the Partition. From purple to yellow to red and white, her colour palette wasn't restricted to being monotonous. It was vibrant, refreshing but not loud or gaudy. It was commendable the way she carried herself and we so want to own everything she picked or dazzled in. From Manish Malhotra to Sabyasachi Mukherjee and Tarun Tahiliani, she justified all the designs and creations of different designers with equal chutzpah. On that note, let's go through her numerous outings which prove our gushfest is only valid. Kalank Box Office Collection: Varun Dhawan and Alia Bhatt Starrer Off to a Good Start, Witnesses 40% Occupancy. Alia Bhatt is blessed with a great fashion sense and her positive aura is hard to match. She can nail any damn silhouette and make it look as easy as one, two, three. As Kalank's Roop gets ready to woo your hearts, here's cheering for her at the top of our lungs.